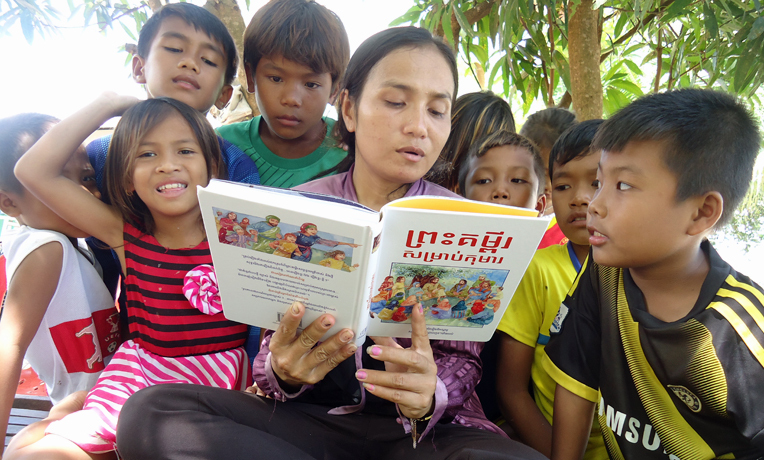 Phan Kunthea is a 33-year-old teacher in Cambodia. She and her husband have taught at Kobthom Primary School for nearly 14 years. I once heard about Jesus in 1997. My husband and I even sometimes attended Christian activities at church, but in the meantime, we didn’t live like we believed The Word of God. I wasn’t really sure about Jesus. When Samaritan’s Purse staff members implemented some water and hygiene programs at our school, they shared with us about Jesus. Kunthea has shared God with her children and hopes to see the kids in her class receive salvation. “Jesus Christ is the mighty God, and He created all the things, even this world and heavenly places,” said Mrs. Chenda, a Samaritan’s Purse staff member. I used to worship idols such as Neak Ta and Chum Neang Ptiah, but since Samaritan’s Purse explained to me the difference between the true living God and the fraud gods or idols that I have worshiped many years, my mind and my eyes are opened clearly to see the real true God is Jesus Christ. My two children and I decided to follow Him and accept Him as our Lord and Savior. My husband is interested in my faith, and I think he will also receive salvation soon. The kids at school are interested in the Good News and the Lord Jesus Christ. I think some of them have already made decisions to follow Him. I pray to the Lord for them to be saved like my children and me. Cambodia Projects Cambodia, one of the poorest nations in the world, has few resources available to care for its people, the majority of whom live in rural areas. We help meet desperate needs for food and livelihoods through animals and agriculture projects, as well as providing access to safe, clean drinking water. Children’s education projects ensure boys and girls remain in school, while increasing their quality of life. Our maternal and child health program reduces the mortality rates of women and their young children by improving obstetric care, teaching essential nutrition practices, and increasing access to quality healthcare. We also combat human trafficking through education and training. Only 2 percent of the country is Christian, and a crucial aspect of our work involves partnering with local churches to help spread the Gospel in their villages.